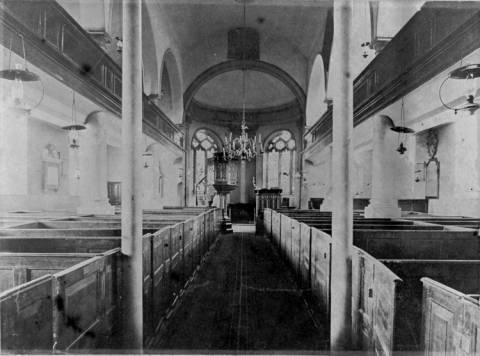 Interior, showing the galleries and pews. The pews are gone, but the galleries remain. 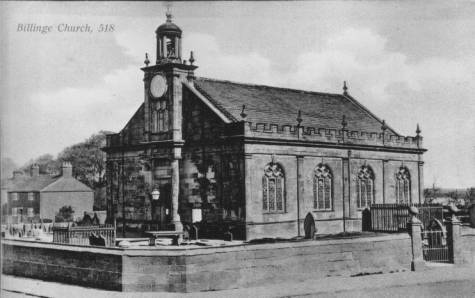 By 1718 a new chapel had been built which was one of the finest in the area at that time. Unfortunately the name of the architect is not known though St James' Church in Over Darwin, designed by Henry Sephton and built about 1720, is very similar. It is known that a James Skaesbrike was a prime mover in the construction of the new building, a memorial to his generosity can be seen on the South wall of the nave, and that the Bankes family also made an equal contribution. It is unfortunate but we know little about Mr Scaesbrike except that he was a Liverpool merchant who had relatives at Winstanley. The new church was a rectangular building with a small apse at the east end. This chapel had a capacity of 200 at a time when the population of Billinge was only about 900, an expected attendance of more than 20% of the residents, we would need several extra churches to accommodate so many today. 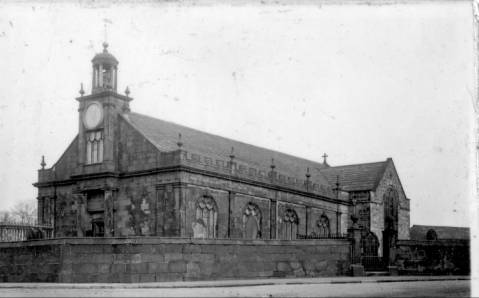 In 1823 and 1824 the capacity of the church was increased by the addition of first the north and then the south galleries. In 1907 a celebrated architect of the time, Mr T G Jackson RA, was employed to extend the church, the apse was moved eastwards and the choir and transepts were added. If one looks at the outside walls of the building the newer work is easily identified by the different stone used to supplement that already available. At this time also the galleries and the box pews were removed, the oak panelling of which the pews were made was installed all round the church and is still to be seen there today, if you look closely you will see the marks left by hinges and catches from the old pew doors. The brass lectern was given in memory of Canon St George and is a copy of that given to York Minster in 1686. The Church is open on Saturday mornings from 10.00am until noon for private prayer or just to look around. A member of the Church will be present if you wish to speak to him / her.